The icy mixture of rain and snow coming down outside the windows of the Duck and Cherry. Have I been out to verify that statement? Yes. And it felt cold, too. I don't mind. It's that time of year. The days are shorter, evening approaches sooner every day, I want to make warm soups and homemade bread, and I am starting to think about Thanksgiving and Christmas. There are still things undone in the garden around the Duck and Cherry. There are projects that have to be continued next spring. But I have no complaints. The summer and autumn have both behaved wonderfully. I saw a sign the other day which said, "If you have a complaint, please press the red button." The red button was placed under a mouse trap. You know, the kind that would hurt your finger if it snapped? 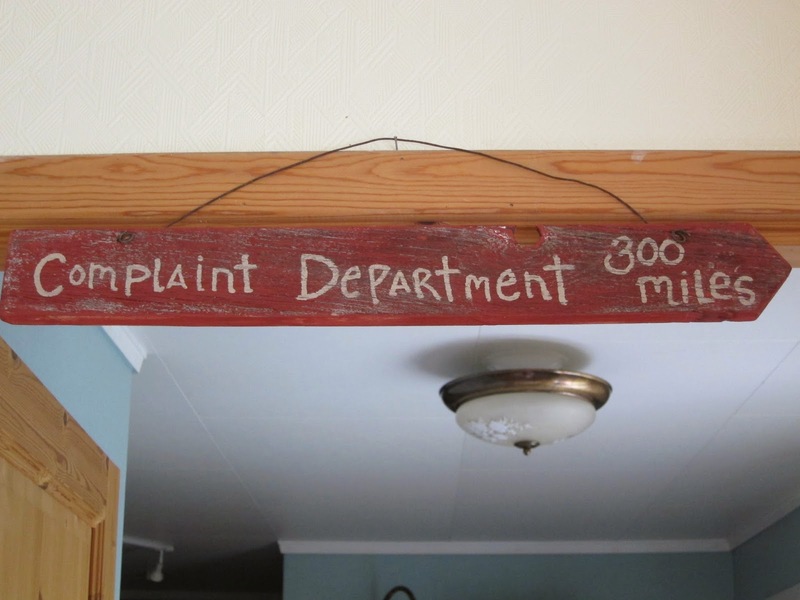 It goes along with the complaint sign in my kitchen. I imagine 300 miles is too far for anyone. By the time they got there, they would have forgotten about why they ventured those 300 miles in the first place. Fatigue and hunger would have overcome their senses and other complaints would have precedence. In my book, complaining is a negative and degrading process - one that takes you downhill and pushes away smiles and harmony. Better keep them complaints few and to the point, if ever they should be allowed out and about. In the meantime, I will tell myself to be better at complimenting and finding good things in people and life. Photo today: A handpainted sign bought in Amish Country in Ohio.